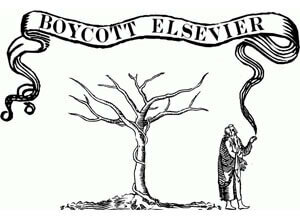 Evolutionary biologist Michael Eisen made this t-shirt design in support of the Elsevier boycott. Academic research is behind bars and an online boycott by 8,209 researchers (and counting) is seeking to set it free…well, more free than it has been. The boycott targets Elsevier, the publisher of popular journals like Cell and The Lancet, for its aggressive business practices, but opposition was electrified by Elsevier’s backing of a Congressional bill titled the Research Works Act (RWA). Though lesser known than the other high-profile, privacy-related bills SOPA and PIPA, the act was slated to reverse the Open Access Policy enacted by the National Institutes of Health (NIH) in 2008 that granted the public free access to any article derived from NIH-funded research. Now, only a month after SOPA and PIPA were defeated thanks to the wave of online protests, the boycotting researchers can chalk up their first win: Elsevier has withdrawn its support of the RWA, although the company downplayed the role of the boycott in its decision, and the oversight committee killed it right away. But the fight for open access is just getting started. Seem dramatic? Well, here’s a little test. Go to any of the top academic journals in the world and try to read an article. The full article, mind you…not just the abstract or the first few paragraphs. Hit a paywall? Try an article written 20 or 30 years ago in an obscure journal. Just look up something on PubMed then head to JSTOR where a vast archive of journals have been digitized for reference. Denied? Not interested in paying $40 to the publisher to rent the article for a few days or purchase it for hundreds of dollars either? You’ve just logged one of the over 150 million failed attempts per year to access an article on JSTOR. Now consider the fact that the majority of scientific articles in the U.S., for example, has been funded by government-funded agencies, such as the National Science Foundation, NIH, Department of Defense, Department of Energy, NASA, and so on. So while taxpayer money has fueled this research, publishers charge anyone who wants to actually see the results for themselves, including the authors of the articles. Paying a high price for academic journals isn’t anything new, but the events that unfolded surrounding the RWA was the straw that broke the camel’s back. It began last December when the RWA was submitted to Congress. About a month later, Timothy Gowers, a mathematics professor at Cambridge University, posted rather innocently to his primarily mathematics-interested audience his particular problems with Elsevier, citing exorbitant prices and forcing libraries to purchase journal bundles rather than individual titles. But clearly, it was Elsevier’s support of the RWA that was his call to action. Two days later, he launched the boycott of Elsevier at thecostofknowledge.com, calling upon his fellow academics to refuse to work with the publisher in any capacity. The advantages of open access to researchers have been known for some time, but its popularity has struggled. It’s clear that all forms of print media, including newspapers, magazines, and books, are in a crisis in the digital era (remember Borders closing?). The modern accepted notion that information should be free has crippled publishers and many simply waited too long to evolve into new pay models. When academic journals went digital, they locked up access behind paywalls or tried to sell individual articles at ridiculous prices. Academic research is the definition of premium, timely content and prices reflected an incredibly small customer base (scientific researchers around the globe) who desperately needed the content as soon as humanly possible. Hence, prices were set high enough that libraries with budgets remained the primary customers, until of course library budgets got slashed, but academics vying for tenure, grants, relevance, or prestige continued to publish in these same journals. After all, where else could they turn…that is, besides the Public Library of Science (PLoS) project? In all fairness, some journals get it. The Open Directory maintains a list of journals that switched from paywalls to open access or are experimenting with alternative models. Odds are very high that this list will continue to grow, but how fast? And more importantly, will the Elsevier boycott empower researchers to get on-board the open access paradigm, even if it meant having to reestablish themselves in an entirely new ecosystem of journals? As the numbers of dissenting researchers continue to climb, calls for open access to research are translating into new legislation…and the expected opposition. But let’s hope that some are thinking about breaking free from the journal model altogether and discovering creative, innovative ways to get their research findings out there, like e-books or apps that would make the research compelling and interactive. Isn’t it about time researchers took back control of their work?